Today we will look at the Cushy Bean Pad - 4 Piece Set. The Cushy Beans Sit Cushion provides a portable seating option for almost anyone. The cushion itself is made from a waterproof material with three different machine washable covers, all in different textures. Therefore, you can tailor make the cushion for the child’s particular tactile needs. The micro-bead stuffing provides children with the ability to have a stable surface on which they can also move. The white inner cushion is waterproof and surface washable. · The cushion can be used for adaptive seating in almost any setting as it is portable and easy to carry. It can be used to sit on or as a lap buddy placed on top of the legs. · Use the cushion for tactile stimulation. Have the child rank the covers in order of preference. Start with the most preferred cover. Place the cushion on top of the child’s lap and set a timer for a maximum time limit of choice while performing other activities. After that time limit has been achieved, remove the cover and move to the next in line. See if the child can tolerate the cushion on his/her lap for the same time limit. Repeat with the third cover. · The cushion is ideal for fine motor strengthening. Have the child change the covers on the cushion. 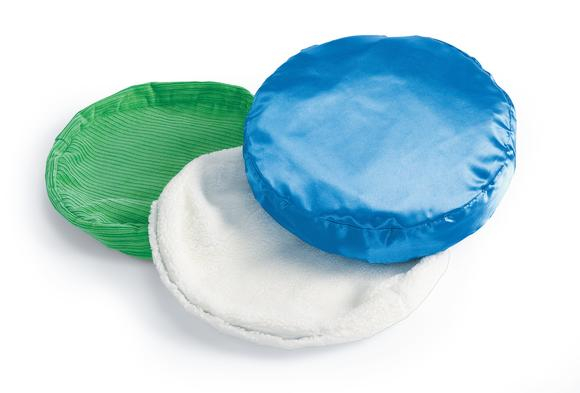 For more information about the Cushy Bean Pad - 4 Piece Set and other great items please visit http://www.achievement-products.com.